As a journalist who specializes in topics at the intersection of religion and politics, no one would be more excited than me about a scandal involving the Sea of Galilee and GOP politicians. But I’m just not seeing it. This is SO bad for the Republican Party… The Republican brand, it’s been really hurt over the past five, 10 years … Here you have a group of Republicans … going to a sacred religious site for evangelicals … That reverberates from church to church, from pew to pew, from family to family, from preacher to preacher … They have offended their base … Eric Cantor … needs to SCALD these people politically. Huh? Are we talking about the same story? Here’s what apparently happened: During a congressional trip to Israel last summer, a group of GOP lawmakers, staff, and their families capped off an evening meal in Tiberius—an Israeli town in the Galilee—by swimming in the Sea of Galilee. They had alcoholic beverages during dinner. One GOP congressman doffed all his clothes for the swim. Okay, that one congressman—Kevin Yoder of Kansas—clearly forgot one very important workplace rule: Never go skinny-dipping with your colleagues or staff. I feel weird enough chatting up colleagues at pool parties while wearing a swimsuit. But aside from that behavior unbecoming a congressional representative, what’s the scandal here? That members of Congress are not teetotalers? Did Yoder waggle his Member’s member in front of a colleague’s young daughter? Oops. I can’t let it go unnoted that in Allen’s excited promotion of the SkinnyDipGate yesterday, he included one of his patented “LESSON[S] FOR YOUNG REPORTERS: Nothing is more valuable in the Wild West of journalism than dogged, important, air-tight reporting.” I’ll give him dogged—the Politico duo had a dozen sources, including eyewitnesses, bro! But I see nothing air-tight or important about this story. I see August. 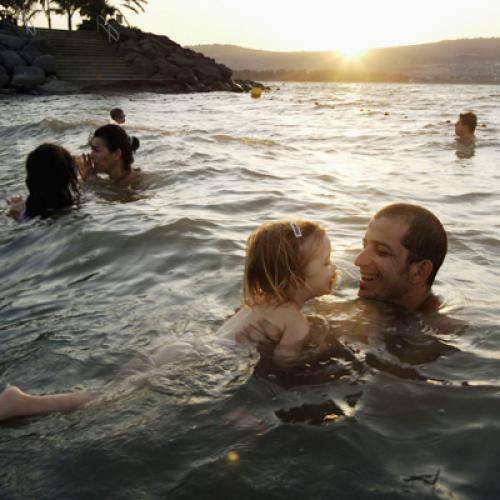 Yes, the Galilee is a spiritual site for many Christians. I got verklempt thinking about Jesus and his disciples swimming and fishing in those very same waters. But it’s not like Yoder cannon-balled into a baptism in the River Jordan. Or ignored everything Jesus said about the poor. Now that would be a story.